Do you have a question about climate change vulnerability assessment or planning? As part of our Tribal Vulnerability Assessment Resources, the Climate Impacts Group hosts a technical support desk designed to respond to as-needed tribal queries regarding the climate change vulnerability assessment and adaptation process. 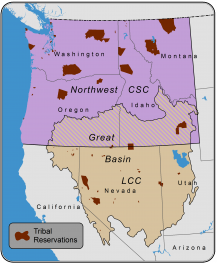 This service is available to any tribe within the Northwest or Great Basin (see below figure). No question is too simple or too complex – if we don’t know the answer we will put you in touch with somebody who does. The technical support desk is designed to be relevant and available to the ~90 tribes within the Northwest and Great Basin regions.